Bhubaneswar: Creating a new standard in disaster preparedness, the multi-departmental control room completed its first 24 hours of operation in Bhubaneswar Municipal Corporation (BMC), this evening. Within this period it managed situations for more than 30 calls from the storm water and other helpline numbers. 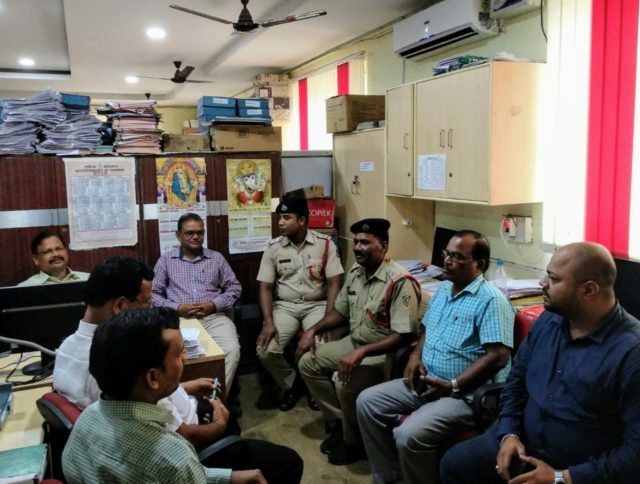 Officials from different departments like Revenue and Disaster Management, Odisha Fire Services, Public Works Department, Water Resources and Public Health Engineering Organisation (PHEO) and BMC were part of the control room, which is operating since last evening after the emergency meeting, convened under the chairmanship of Municipal Commissioner Dr. Krishan Kumar at the BMC Conference Hall. The multi-departmental control room is functioning on a 24X7 basis with the officials doing their duty in three shifts i.e. from 6 am to 2 pm, 2 pm to 10 pm and 10 pm to 6 am basis. Yesterday, during a multi-department preparedness meeting the Municipal Commissioner has asked all line departments working in the city to be vigilant and do their bit to help citizens in the wake of the IMD warning of heavy to very heavy rainfall in and around the State Capital. It can be noted here that while the BMC-Fire Services joint initiative had pre-positioned 30 pumps from 7.30 pm last evening, 15 pumps were operated to dewater water-logged areas. Similarly today 10 pumps were pre-positioned today since 6 am at various vulnerable points and low-lying areas across the city including heritage sites. Since early this morning six excavators (JCBs) of Public Works Department were positioned at Ganganagar Square, Rajmahal Square, Old Town area, Old Airport Square, Samantarapur and Padhan Sahi Square along Kapilaprasad Jatni Road and they were used as per the directions from the control room and local ward-based teams. BMC limits has been divided into 13 sub-zones or sectors with senior officers taking their sectoral positions and in-charge of decision making activities during heavy rains. The 13 senior officials of sub-zones are coordinating with the line departments like PWD, PHEO, Fire Services, District Administration, OWSSB, CESU and Water Resources. It can be mentioned here that pre-planned disaster preparedness strategy followed by the district administration of Ganjam during Pahilin in2013 as the preparedness could reduce the human casualty in comparison to the devastation caused by the Super Cyclone, 1999. In fact, Odisha was felicitated by UN for the disaster preparedness plan. A Joint enforcement team of BDA and BMC today took up demolition drive in Jagmohan Nagar along Drainage Channel No. 9 and Sai Temple Road along Tankapani Road. While the joint squad went to Jagmohan Nagar after getting complaints from local residents that Government land, road and the drainage channels are encroached causing water-logging conditions. Near Sai Temple along Tankapani Road the drain in front of the temple was found already blocked. It can be mentioned here that the civic and development authorities have announced a ‘’Zero Tolerance Policy’’ and undertake intensive action to make the drainage channels and drains free from any encroachment.